The legalization of marijuana is in the news this 2012 election year. In the state of Washington, initiative 502 is on the ballot this fall. The measure would make it legal for adults to possess small amounts of marijuana for personal use (not just for medical purposes), while restricting the use by minors. In California, there is a great deal of activity regarding medical marijuana clinics and the possible abuses inherent in a relatively non-regulated activity. On the federal level, marijuana is still classified as a Schedule I drug in the same category as heroin or cocaine. Into this controversy comes Too High to Fail. The book deals mainly with the activities of marijuana growers in and around Mendocino County, California. The author lived in the community for about a year, getting to know the citizens of the area and learning about the growth and distribution of marijuana. 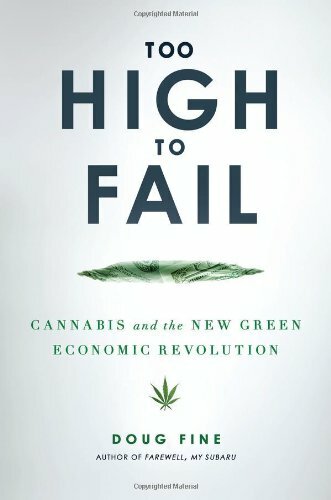 Too High to Fail is a long song of praise for marijuana and a continued puzzlement as to why the drug remains illegal. Largely anecdotal in nature, Too High to Fail explores the culture of growers in the region. We get a detailed course in how to grow marijuana, and we learn about the complicity of the local law enforcement agencies not only looking the other way, but often actively supporting the growers. A great deal of energy is spent in defending the growers by emphasizing they are involved in the growth and supply of medical marijuana, not illicit use. But the author spends a great deal of time emphasizing the economic benefits that the state and federal governments would enjoy if the crop were legal and could be taxed. There are some major shortcomings in the book, engaging as it is. There is no scientific discussion about why marijuana is considered dangerous enough to be classified as Schedule I. We also do not see any serious discussion about the medical use of marijuana—a lot of personal testimony, but little or no documented research on the benefits and drawbacks to the use of marijuana as a medication. There is also no discussion of diversion of any of the crop for recreational use. One is left with the impression that the good citizens of Mendocino County are all on the medication for a variety of health problems or are carefully providing materials only for those who need it for health reasons. A “feel-good” book written by an obvious convert to the cause of legalizing marijuana—yes. An interesting insider picture of a counterculture many of us are not familiar with—that, too. In the end, some very good questions are raised in Too High to Fail, but the answers will need to come from a more convincing source.